Make sure to make the weapon 2 Burst. Awesome! Damn. I need a like button. At the very least, this will do. Forgot to say this uses ChargeTurret Logic... added the code to copy+paste in on the original topic. I always liked your work. I modified the cameo a little bit. Matches the rest of the Soviet Navy cameos better, I think. I've been trying to get it to look like that for a while but i keep messing up the hull instead. Nice remake. Too bad there isn't many naval voxels. 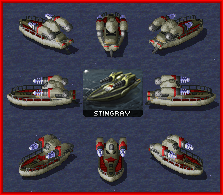 If i remember the Stingray can also move on land as well but is there a way to change between the land and water voxel ? You can make a unit have alternative land-water versions with Ares. That's great. So they will not know that the cameo icon is taken from an in-game screenshot. What about the "full" codes in rulesmd & artmd? look at other units with similar logic if you don't know how to fully code it. copy/paste and a little adaptation works wonders.